Rudolf Steiner was for many years prior to World War I a leader of the German branch of the Theosophical Society. One of his best known books is titled Theosophy and the two pillars of Steiner’s approach are in common with other theosophical writers: the law of karma and evolution through the workings of spiritual energy. For Steiner karma and spiritual energy, which he called love, are the basic laws of Nature. 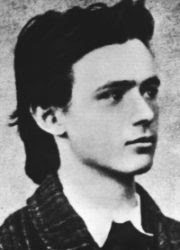 Rudolf Steiner in his youth. In 1913, Steiner left the Theosophical Society finding that its emphasis on Hindu cultural expression of karma and evolution through multiple reincarnations did not fit the German cultural milieu. He tried to express the same two concepts in a more German style drawing on the writings of Goethe and the German Romantics. He called his approach Anthroposophy (knowledge of man) rather than Theosophy (knowledge of the Theos which is often called God). In both systems, it is the laws of Nature working themselves out in human life which is what knowledge is about. Steiner believed that he saw subtle energies at work – saw and not just sensed. If one sees subtle energies, then one sees how karma impacts individual lives but also the life of a nation. Steiner stressed that there was a “national soul” and that the action of a country would have long-range consequences such as the First World War which he had experienced. With a view of the workings of subtle energies, one understands the working of these energies both in the lives of people but also plants, trees and animals. Thus Steiner also turned his attention to agriculture and the ways that subtle energies such as the phases of the Moon could influence the growth of plants. For Steiner, these subtle energies that structured the evolution of humans and nature, he called love. “Love is the creative force in the world”. Within the individual, love creates devotion and selfless veneration. “Only that which I love will reveal itself to me, and every revelation must fill me with gratitude, for each one makes me inwardly the richer.” This love will gradually widen its love so that it embraces all existence. Agriculture with the ‘biodynamic agriculture’, a forerunner of the growing movement for ecologically-sound agriculture. There are some 500 Steiner schools and their number keeps expanding. It is the largest non-religious private school movement in the world. The Camphill communities for the mentally-retarded were developed by Steiner teachers who left Austria and Germany in the late 1930s for England. Some were Jews, others were under pressure as the Nazi government had closed all the Steiner schools. As there was already a well developed private school tradition in England (even if they are called ‘public schools’) the Steiner people turned to caring for the mentally retarded as there was little creative work with the mentally handicapped in England. After the Second World War, the Camphill movement then expanded to other countries in Europe, the USA and Israel. Steiner gave the name ‘biodynamic’ to his proposed methods of agriculture. For Steiner, the agricultural techniques proposed were based on his supra-sensitive knowledge of the soul forces operative in the soil, plant and animal world. Biodynamic agriculture is increasingly important as an alternative to chemically-dominated farming in Europe and North America and has spread to Australia and New Zealand. There are yearly courses for farm-related persons given at the Goetheanum in Switzerland, the headquarters of the Steiner work. There is a large use of astrology and cycles of the moon in biodynamic agriculture, again based on Steiner’s understanding of the influence of the moon and planets upon life on earth. Steiner was also concerned with social reform but stressed that one needed a positive view of the future and not a criticism of the present. Steiner held that what is needed in times of crisis is not to harbour many thoughts about the surrounding world because such thoughts only strengthen the disorder of the outward world, but one should use meditation — an inner will-permeated work to bring harmony and equilibrium. Nevertheless, Steiner was well conscious of events of the times — the breakup of the Austro-Hungarian Empire in which he was born (in what is today Croatia) and the changes in Germany where he had spent most of his working life. Moreover, in 1922, the first Goetheanum, which was built of wood and whose style represented Steiner’s spiritual insights was completely destroyed by fire, probably by Right-wing German thugs. Thus, he turned his attention to proposals for the reconstruction of society, in particular banking as finance and monetary policy was at the heart of the crisis.